This part of the Python Bookshelf tutorial shows how to create a sign-in flow for users and how to use profile information to provide users with personalized functionality. Click OAuth consent screen. For the product name, enter Python Bookshelf App. In the Name field, enter Python Bookshelf Client. This section uses code in the 4-auth directory. Edit the files and run commands in this directory. The application redirects the user to Google's authentication service, which redirects the user back when authorized. 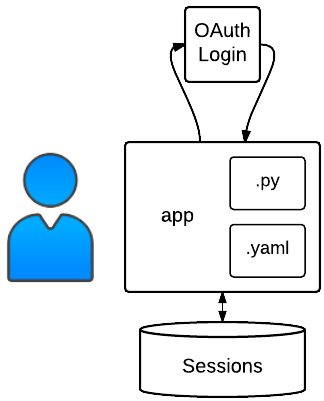 The application stores the user's profile information in the session. Before your application can authenticate users, you will need a way to store information about the current user in a session. Flask, which includes sessions backed by encrypted cookies, provides this capability. To use sessions with Flask you must configure a secret key for your application. Flask recommends using urandom to generate a random key. Copy and paste the final output into config.py as your secret key. In production, you may want use a centralized database to store sessions securely. Google Cloud Platform makes it easy to deploy many databases, including Redis or Memcache. Setting up these services is outside of the scope of this tutorial. The flask_util extension in oauth2client makes it easy to integrate OAuth2 into your application without having to implement the flow yourself. Initialize the instance with the Flask application. The scopes email and profile give us access to the user's email address and basic Google profile info. # Initalize the OAuth2 helper. Create a way for users to log out, as flask_util does not provide this by default. # Add a logout handler. # Delete the user's profile and the credentials stored by oauth2. After you obtain credentials, you can fetch information about the user. The credentials include an id_token that will give you the user’s ID and email address, but it would be more useful to obtain some basic profile information such as the user's name and photo. The Google OAuth2 API method userinfo can provide that for any authenticated user. UserOAuth2 has an authorize_callback argument that can be used to execute a function after credentials are obtained for the user. Now that you have the logged-in user's information available via the session, you can keep track of which user added which book to the database. # If an image was uploaded, update the data to point to the new image. # If the user is logged in, associate their profile with the new book. Now that you have that information in the database, you can use it to create a new view that allows a user to see all the books that they have added. Notice that this view is decorated with oauth2.required, which means that only users who have valid credentials will be able to access this view. If the user does not have credentials, they will be redirected through the OAuth2 web flow. This code uses a new model method called list_by_user. The implementation depends on which database backend you chose.